On October 27th, 1973, drivers from all corners of the motorsport world met on the tarmac of the Riverside International Raceway. The 12 drivers each held their own titles for their endeavors in racing, but IROC, the International Race of Champions, had drawn them all in as a true test of driver skill to see who would come out on top as the best racer of their era. Roger Penske approached Porsche to have them build 15 identical cars. With any sort of modification or advantageous opportunities thwarted by regulations, the spec Porsches leveled the playing field and allowed each driver to demonstrate their prowess on the American road courses. The cars were an interesting mix of the Porsche RS and RSR models, each in a different color of the rainbow. With a legendary list of drivers and exciting competition throughout the season, the IROC Porsches have earned a place in Porsche's rich racing heritage, despite only racing for a single year. Intrigued by their history in racing and their sleek likes, Bisi Ezerioha turned to the IROC series for inspiration when it came time to revisit the styling on his 930 Porsche. In years passed, the car had made its rounds at races and shows with a towering spoiler, modern skirts, and front splitter. The aggressive styling gave a tuner-esque feel to the car that Bisi had built up from a bare shell in 2009, but this past year, he began searching for ways in which to refine the character of his beloved 911. In working with Matt Crooke from Fifteen52, Bisi began to strip the car back to an older era of racing. 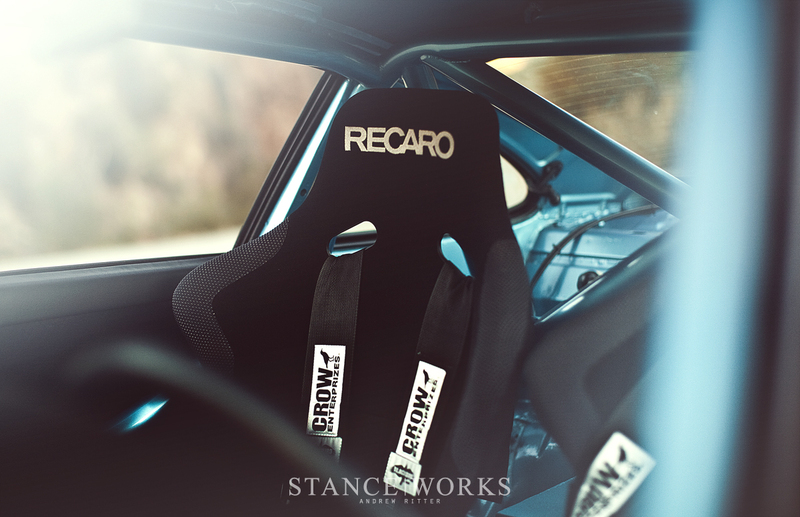 The IROC cars carefully balanced the aggressive styling of racing with the humble nature of spec production cars, and this balance was in line with the philosophy that Bisimoto operates under. While the fenders were much wider than the standard narrow bodied 911s, the IROC fenders were still narrower than that of the RSR racecars, and their smooth, polished lines manage to add a sense of elegance to otherwise monstrous hips. Their side profiles, like many race cars in the '70s, were slim and sleek without side skirts. It was in this understated, race-prepped harmony that Bisi found his new inspiration. Soon, his GT2 style spoiler was replaced by a classic tea tray spoiler just as they had replaced the original factory duck tails when the IROC cars came over for their first race. With the modern side skirts removed, an IROC bumper outfitted the front end and gave the car the strong protruding jaw line that would fit right in with IMSA racers of the same era. Bisi looked even further back in the history books, to the Porsche 550 Spyder for inspiration on side mirrors. The aerodynamic fender mirror may have its roots in decades before the '74 race season, but its style and sleek contours mimic many of the mirrors also found on the Group 5 cars of the late 70s and early 80s. As the body work neared completion, it was time to decide on a color. With the recent advent of color TV, the '74 IROC cars were each painted their own vibrant color to intrigue viewers. 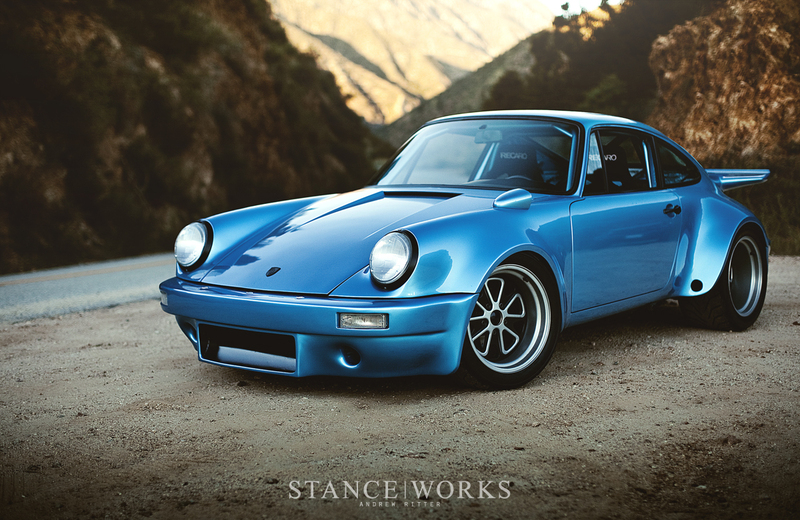 To this day, many people are still familiar with the colorful spectrum of Porsches that charged down the straights of Riverside, so it seemed fitting for Bisi to maintain the car's bright blue paint through its backdate transformation. Its bright shine would be at home in the Californian paddocks next to the rainbow of RSRs. 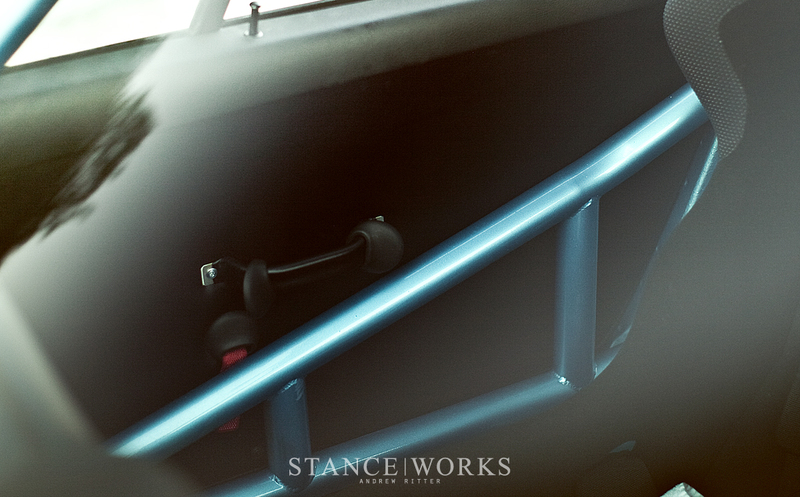 Before long, the car's newly refined persona began to take shape, but Bisi knew he would need to properly fill the large fender wells that played such a role in the car's demeanor. The guys at Fifteen52 had the answer. 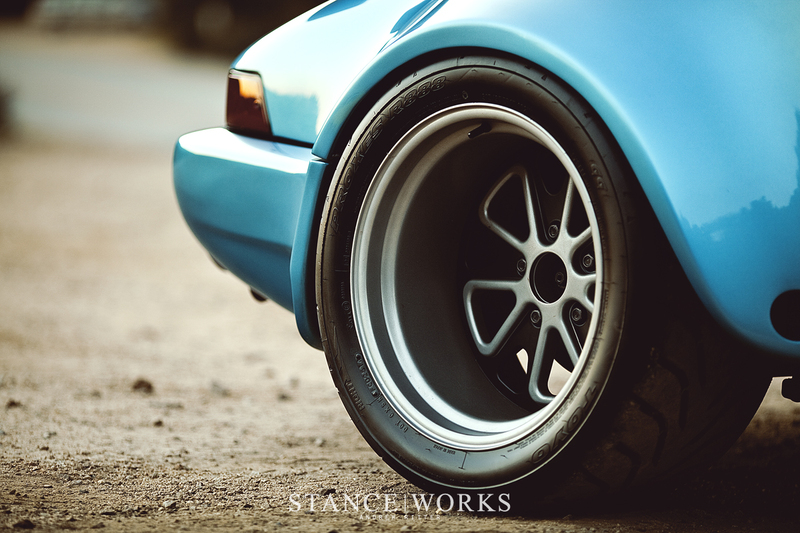 Their recent collaboration with Porsche builder, Magnus Walker, implemented a modern twist on the classic Fuch wheel and offered an excellent modern option for the backdated IROC recreation. Shod in a meaty set of Toyo R888s, the 17x9 and 17x11 Fifteen52 Outlaw wheels were finished in the same silver and black two-tone that filled the arches of the 1974 911 racecars. The impressive width fits neatly under the arches and from the rear, gives off an intimidating steamroller appearance that is meant for pure performance. As you admire the view from the rear, the mild mannered exterior begins to give way to the ferocity that lives under the deck lid. Taking notes from its older brother, the 935, Bisi's 930 has a pair of turbos situated where one would expect to find a simple license plate tub, dumping out the exhaust and roaring through the canyons on the day of our shoot. It's a less-than-subtle hint at the power that churns away behind the driver. To understand the unorthodox drivetrains found within Bisimoto engine bays, one must first understand the mad scientist behind it all. Bisi first honed his skills in Chemical Engineering, working for a stint in Pharmaceutical research. While he was working away in the lab, learning about fluid dynamics and other scientific complexities, the car enthusiast in him was focused on finding ways to go faster. He developed parts for his own personal car, and before long the demand from fellow speed junkies had reached a fervor. In 2006, Bisi decided it was time to answer the call and he began contributing his scientific knowledge to the automotive world under the name Bisimoto. Now, 9 years later, Bisimoto has become a company known for applying carefully designed parts to often-overlooked drivetrains to illicit unheard of power. Building reputation with builds like his 1000hp Honda Odyssey or the Hyundai Sonata that pumps 888hp through it's small 4 cylinder, Bisimoto has set out to prove what engines are truly capable of. With a background situated in labs where accuracy and test figures reign supreme, Bisi is a man of careful refinement. As he develops parts for his cars, he approaches them with an open mind, considering the different courses of action, even those that stray from the norm. His goal is to produce reliable power each engine and he revels in the engineering challenge that each presents. Bisi is a true craftsman when it comes to engines, and the Bisimoto Porsche 930 is another example of his expertise at work. 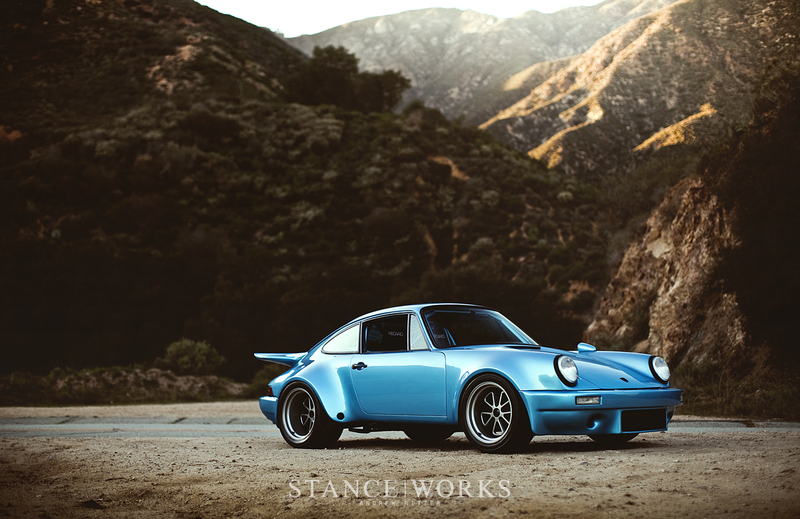 The retro-styled 911 gets its punch from a much more recent powerplant. Behind the rear wheels sits a watercooled M96 from the Porsche 996, posing the largest hurdle in the build with its size and additional cooling system requirements. It's challenges such as this that test Bisi's engineering skills, but he is not one to disappoint, and with each hurdle navigated, Bisimoto develops a set of parts that allow future builders to face these challenges with ease. The first order of business once he was sure it would fit was addressing the D-chunking issues that plagued the cylinders of the M96 engine variants. 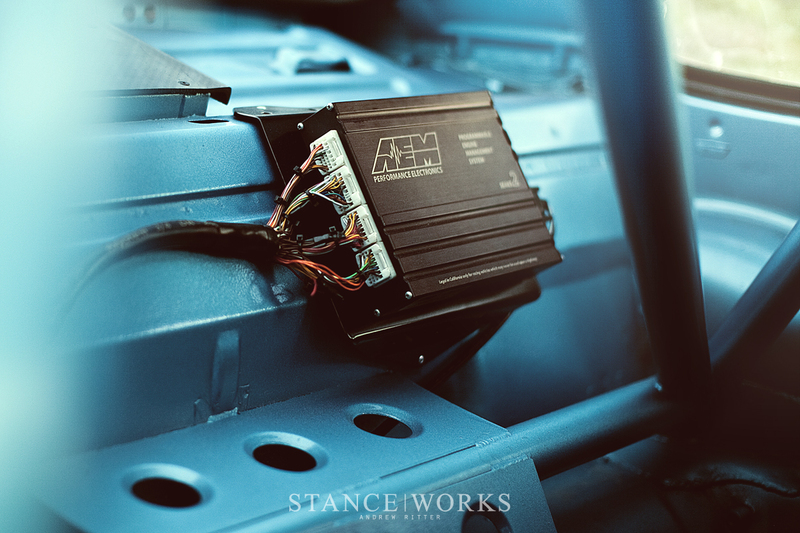 A set of ductile iron braced sleeves offer a much more rigid environment for the 9:1 Arias and Bisimoto steel rods to push through as RPMs increase. 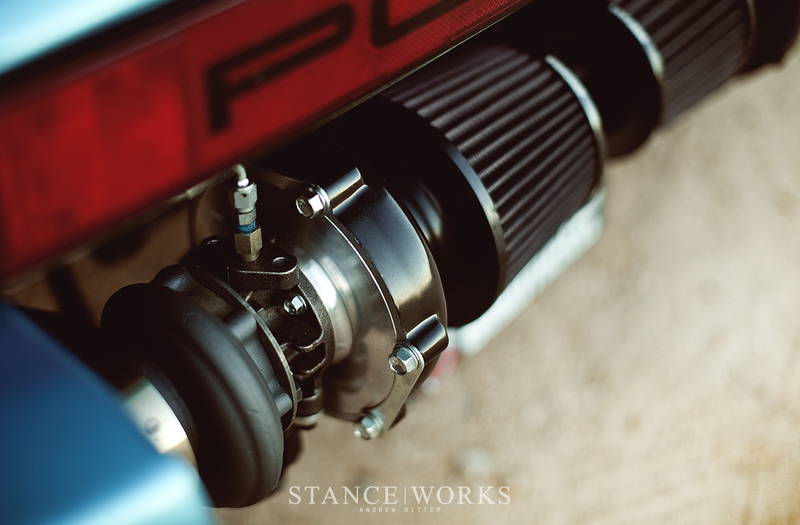 As the tach climbs higher, Bisimoto dual springs and titanium retainers press against his 2.4 level camshafts, and the low-friction, WPC treated crankshaft cuts through the synthetic PurOl oil with ease. Keeping it all under control and purring in unison is an AEM EMS inside the bare interior. The twin Bisimoto/Turbonetics BTX5857 ball bearing turbochargers were responsible for the sounds that echoed off the canyon walls upon our ascent. Fitted to the rear-most limits of the M96 with a Bisimoto twin-turbo kit, the forced induction naturally introduces a whole new set of challenges for an engine bay as small as that of the 911. The result is a custom intercooler that pipes its way up above the engine to grab cool air. 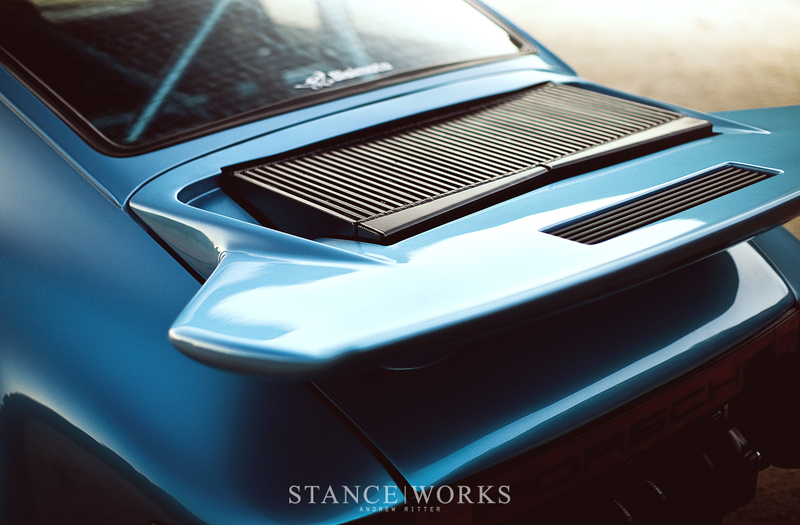 Each pipe hides behind a natural bulge below the spoiler that would never cause a second thought, and the black intercooler sits just above the large tea tray spoiler, mimicking the black grates that often accompanied the Carrera tails. Placing a modern watercooled engine where an old aircooled variant once thrived comes with cooling requirements of its own. The IROC front bumpers were always known for the large central grill meant to cool the piping hot oil as the cars raced through the Californian deserts. Bisi has re-appropriated the inlet by directing the air up, pushing it through a dual pass radiator system to cool off the M96 after a proper run through the twisting roads. Underneath the unassuming spec-class exterior, breathes a hearty twin-turbo engine that has managed to to peg Bisimoto's inhouse dyno at 1100whp under the influence of race gas and larger previous turbos. In the name of balance and drive-ability, the featherweight monster has been tamed, scaled back to 91 Octane and the smaller BTX5857 turbos. In its current guise, the 911 puts down 820whp and 618 ft/lbs of torque at 19psi, offering a more manageable kick to the 2,430lb chassis. Utilizing his knowledge and determination, Bisi has managed to truly push the boundaries of power and produce a car that can, at the same time, reliably run 1/2 mile drag races, tackle the canyons, and drive through city streets to various shows without flinching. When someone like Bisi is able to apply their passion and a carefully refined set of skills to a build such as this, it deserves a moment of celebration. Now that it's back on the road, Bisi will be running it through its paces and enjoying the car as any Porsche driver should, but knowing him, it won't be too long before he unveils another engine that leaves us in awe . . . and I can't wait. It’s so refined the real Porsche parts don’t fit the cheap eBay rs door panels revealing those sweet self tapper button head screws…. Such an awesome build tho. Dudes full on Porsche like whoa. no pictures of the engine!?! This thing is wallpaper material! What a beautiful machine! 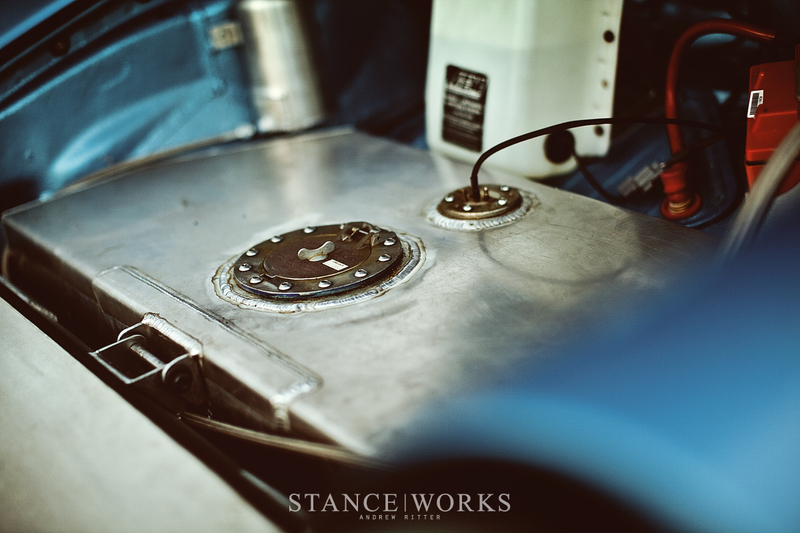 jackhossross – Due to being tucked into such a small space and loaded from below, photographing a Porsche engine is difficult. With the decklind up on Bisi’s car, most of the engine is hidden by the massive intercooler and the associated piping. @Homicidium agreed. Need a desktop background. WHY ??? Why destroy an otherwise beautifulTurbo ??? @Homicidium Thought exactly the same! Every Picture in a slideshow. I need it.